Thessaloniki (Greek: Θεσσαλονίκη, Thessaloníki, [θesaloˈnici]), also familiarly known as Thessalonica or Salonica, is the second-largest city in Greece and the capital of Macedonia, the administrative region of Central Macedonia and the Decentralized Administration of Macedonia and Thrace. Its nickname is η Συμπρωτεύουσα (Symprotévousa), literally "the co-capital", a reference to its historical status as the Συμβασιλεύουσα (Symvasilévousa) or "co-reigning" city of the Eastern Roman (Byzantine) Empire, alongside Constantinople. The city of Thessaloniki was founded in 315 BC by Cassander of Macedon. An important metropolis by the Roman period, Thessaloniki was the second largest and wealthiest city of the Byzantine Empire. It was conquered by the Ottomans in 1430, and passed from the Ottoman Empire to Greece on November 8, 1912. The name Σαλονίκη Saloníkē is first attested in Greek in the Chronicle of the Morea (14th century), and is common in folk songs, but it must have originated earlier, as al-Idrisi called it Salunik already in the 12th century. 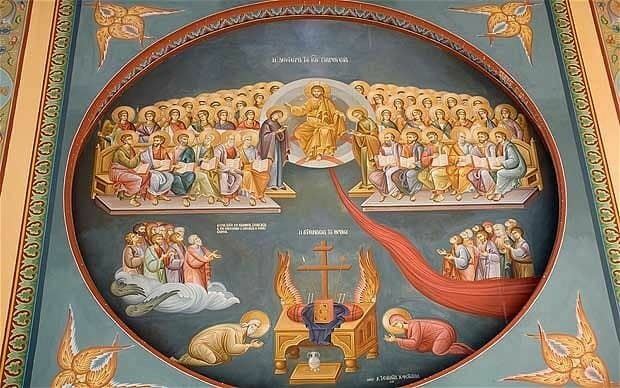 It is the basis for the city's name in other languages: Солѹнь (Solun) in Old Church Slavonic, סלוניקה (Salonika) in Ladino, Selânik سلانیك in Ottoman Turkish and Selanik in modern Turkish, Solun or Солун in the local and neighboring South Slavic languages, Салоники (Saloníki) in Russian, and Sãrunã in Aromanian, and Salonica or Salonika in English. Thessaloniki was revived as the city's official name in 1912, when it joined the Kingdom of Greece during the Balkan Wars. In local speech, the city's name is typically pronounced with a dark and deep L characteristic of Macedonian Greek accent. The name is often abbreviated as Θεσ/νίκη. After the fall of the kingdom of Macedon in 168 BC, in 148 BC Thessalonica was made the capital of the Roman province of Macedon. Thessalonica became a free city of the Roman Republic under Mark Antony in 41 BC. It grew to be an important trade-hub located on the Via Egnatia, the road connecting Dyrrhachium with Byzantium, which facilitated trade between Thessaloniki and great centers of commerce such as Rome and Byzantium. Thessaloniki also lay at the southern end of the main north-south route through the Balkans along the valleys of the Morava and Axios river valleys, thereby linking the Balkans with the rest of Greece. The city later became the capital of one of the four Roman districts of Macedonia. Later it became the capital of all the Greek provinces of the Roman Empire because of the city's importance in the Balkan peninsula. In 306 AD, Thessaloniki acquired a patron saint, St. Demetrius, a native of Thessalonica whom Galerius put to death. A basilical church was first built in the 5th century AD dedicated to St. Demetrius. In 379, when the Roman Prefecture of Illyricum was divided between the East and West Roman Empires, Thessaloniki became the capital of the new Prefecture of Illyricum. In 390, Gothic troops under the Roman Emperor Theodosius I, led a massacre against the inhabitants of Thessalonica, who had risen in revolt against the Gothic soldiers. By the time of the Fall of Rome in 476, Thessaloniki was the second-largest city of the Eastern Roman Empire. During the 6th and 7th centuries, the area around Thessaloniki was invaded by Avars and Slavs, who unsuccessfully laid siege to the city several times, as narrated in the Miracles of Saint Demetrius. Traditional historiography stipulates that many Slavs settled in the hinterland of Thessaloniki; however, modern scholars consider this migration to have been on a much smaller scale than previously thought. In the 9th century, the Byzantine Greek missionaries Cyril and Methodius, both natives of the city, created the first literary language of the Slavs, the Glagolic alphabet, most likely based on the Slavic dialect used in the hinterland of their hometown. The capture of Gallipoli by the Ottomans in 1354 kicked off a rapid Turkish expansion in the southern Balkans, conducted both by the Ottomans themselves and by semi-independent Turkish ghazi warrior-bands. By 1369, the Ottomans were able to capture Adrianople. Thessalonica, ruled by Manuel II Palaiologos (r. 1391–1425) itself surrendered after a lengthy siege in 1383–1387, along with most of eastern and central Macedonia. Initially, the surrendered cities were allowed complete autonomy in exchange for payment of the kharaj poll-tax. Following the death of Emperor John V Palaiologos in 1391, however, Manuel II escaped Ottoman custody and went to Constantinople, where he was crowned emperor, succeeding his father. This angered Sultan Bayezid I, who laid waste to the remaining Byzantine territories, and then turned on Chrysopolis, which was captured by storm and largely destroyed. Thessalonica too submitted again to Ottoman rule at this time, possibly after brief resistance, but was treated more leniently: although the city was brought under full Ottoman control, the Christian population and the Church retained most of their possessions, and the city retained its institutions. Thessalonica remained in Ottoman hands until 1403, when Emperor Manuel II sided with Bayezid's eldest son Süleyman in the Ottoman succession struggle that broke out following the crushing defeat and capture of Bayezid at the Battle of Ankara against Tamerlane in 1402. In exchange for his support, in the Treaty of Gallipoli the Byzantine emperor secured the return of Thessalonica, part of its hinterland, the Chalcidice peninsula, and the coastal region between the rivers Strymon and Pineios. Thessalonica and the surrounding region were given as an autonomous appanage to John VII Palaiologos. After his death in 1408, he was succeeded by Manuel's third son, the Despot Andronikos Palaiologos, who was supervised by Demetrios Leontares until 1415. Thessalonica enjoyed a period of relative peace and prosperity after 1403, as the Turks were preoccupied with their own civil war, but was attacked by the rival Ottoman pretenders in 1412 (by Musa Çelebi) and 1416 (during the uprising of Mustafa Çelebi against Mehmed I). Once the Ottoman civil war ended, the Turkish pressure on the city began to increase again. Just as during the 1383–1387 siege, this led to a sharp division of opinion within the city between factions supporting resistance, if necessary with Western help, or submission to the Ottomans. During the Ottoman period, the city's population of Ottoman Muslims (including those of Turkish and Albanian origin, as well as Bulgarian Muslim and Greek Muslim convert origin) grew substantially. According to the 1478 census Selânik (سلانیك), as the city came to be known in Ottoman Turkish, had a population of 4,320 Muslims, 6,094 Greek Orthodox and some Catholics. No Jews were recorded in the census. Soon after the turn of the 15th to 16th century, however, nearly 20,000 Sephardic Jews immigrated to Greece from the Iberian Peninsula following their expulsion from Spain by the 1492 Alhambra Decree. By c. 1500, the numbers had grown to 7,986 Greeks, 8,575 Muslims, and 3,770 Jews. By 1519, Sephardic Jews numbered 15,715, 54% of the city's population. Some historians consider the Ottoman regime's invitation to Jewish settlement was a strategy to prevent the ethnic Greek population from dominating the city. Thessaloniki was the capital of the Sanjak of Selanik within the wider Rumeli Eyalet (Balkans) until 1826, and subsequently the capital of Selanik Eyalet (after 1867, the Selanik Vilayet). This consisted of the sanjaks of Selanik, Serres and Drama between 1826 and 1912. Thessaloniki was also a Janissary stronghold where novice Janissaries were trained. In June 1826, regular Ottoman soldiers attacked and destroyed the Janissary base in Thessaloniki while also killing over 10,000 Janissaries, an event known as The Auspicious Incident in Ottoman history. In 1870–1917, driven by economic growth, the city's population expanded by 70%, reaching 135,000 in 1917. The last few decades of Ottoman control over the city were an era of revival, particularly in terms of the city's infrastructure. It was at that time that the Ottoman administration of the city acquired an "official" face with the creation of the Government House while a number of new public buildings were built in the eclectic style in order to project the European face both of Thessaloniki and the Ottoman Empire. The city walls were torn down between 1869 and 1889, efforts for a planned expansion of the city are evident as early as 1879, the first tram service started in 1888 and the city streets were illuminated with electric lamp posts in 1908. In 1888 Thessaloniki was connected to Central Europe via rail through Belgrade, Monastir in 1893 and Constantinople in 1896. Thessaloniki was also the center of activities of the Young Turks, a political reform movement, which goal was to replace the Ottoman Empire's absolute monarchy with a constitutional government. The Young Turks started out as an underground movement, until finally in 1908, they started the Young Turk Revolution from the city of Thessaloniki, by which their revolutionaries gained control over the Ottoman Empire. As the First Balkan War broke out, Greece declared war on the Ottoman Empire and expanded its borders. When Eleftherios Venizelos, Prime Minister at the time, was asked if the Greek army should move towards Thessaloniki or Monastir (now Bitola, Republic of Macedonia), Venizelos replied "Θεσσαλονίκη με κάθε κόστος!" (Thessaloniki, at all costs!). As both Greece and Bulgaria wanted Thessaloniki, the Ottoman garrison of the city entered negotiations with both armies. On 8 November 1912 (26 October Old Style), the feast day of the city's patron saint, Saint Demetrius, the Greek Army accepted the surrender of the Ottoman garrison at Thessaloniki. The Bulgarian army arrived one day after the surrender of the city to Greece and Tahsin Pasha, ruler of the city, told the Bulgarian officials that "I have only one Thessaloniki, which I have surrendered". After the Second Balkan War, Thessaloniki and the rest of the Greek portion of Macedonia were officially annexed to Greece by the Treaty of Bucharest in 1913. On 18 March 1913 George I of Greece was assassinated in the city by Alexandros Schinas. After the defeat of Greece in the Greco-Turkish War and during the break-up of the Ottoman Empire, a population exchange took place between Greece and Turkey. Over 160,000 ethnic Greeks deported from the former Ottoman Empire – particularly Greeks from western Asia Minor and Pontic Greeks as well as Caucasus Greeks from various parts of Eastern Anatolia and the South Caucasus – were resettled in the city, changing its demographics. Additionally many of the city's Muslims, including Ottoman Greek Muslims, were deported to Turkey, ranging at about 20,000 people. The importance of Thessaloniki to Nazi Germany can be demonstrated by the fact that, initially, Hitler had planned to incorporate it directly in the Third Reich (that is, make it part of Germany) and not have it controlled by a puppet state such as the Hellenic State or an ally of Germany (Thessaloniki had been promised to Yugoslavia as a reward for joining the Axis on 25 March 1941). Having been the first major city in Greece to fall to the occupying forces just two days after the German invasion, it was in Thessaloniki that the first Greek resistance group was formed (under the name Ελευθερία, Eleutheria, "Freedom") as well as the first anti-Nazi newspaper in an occupied territory anywhere in Europe, also by the name Eleutheria. Thessaloniki was also home to a military camp-converted-concentration camp, known in German as "Konzentrationslager Pavlo Mela" (Pavlos Melas Concentration Camp), where members of the resistance and other non-favourable people towards the German occupation from all over Greece were held either to be killed or sent to concentration camps elsewhere in Europe. In the 1946 monarchy referendum, the majority of the locals voted in favour of a republic, contrary to the rest of Greece. 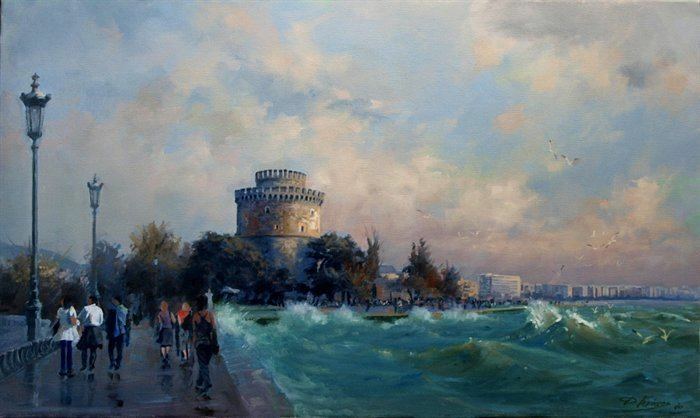 Thessaloniki's climate is directly affected by the sea it is situated on. The city lies in a transitional climatic zone, so its climate displays characteristics of several climates. 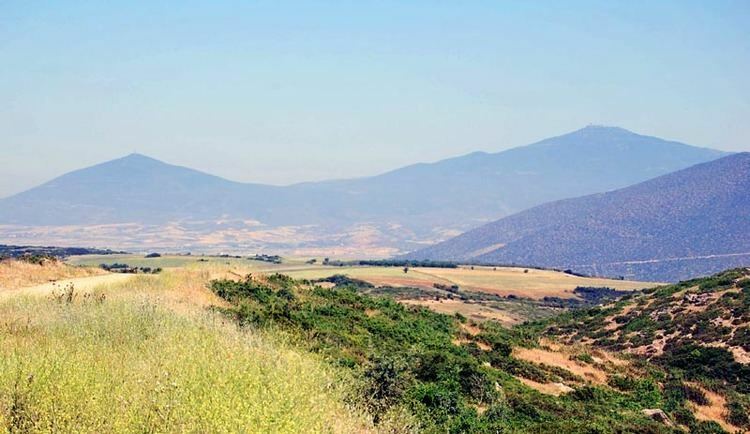 According to the Köppen climate classification, it has a humid subtropical climate (Cfa) that borders on a Mediterranean climate (Csa), as well as a semi-arid climate (BSk), observed on the periphery of the region. With annual average precipitation of 450 mm (17.7 inches) due to the Pindus rain shadow drying the westerly winds. However, the city has a summer precipitation between 20 to 30 mm (0.79 to 1.18 inches), which is prevents it being qualified as a Mediterranean climate (Csa), and increases gradually towards the north and west, turning humid subtropical. According to the Kallikratis reform, as of 1 January 2011 the Thessaloniki Urban Area (Greek: Πολεοδομικό Συγκρότημα Θεσσαλονίκης) which makes up the "City of Thessaloniki", is made up of six self-governing municipalities (Greek: Δήμοι) and one municipal unit (Greek: Δημοτική ενότητα). The municipalities that are included in the Thessaloniki Urban Area are those of Thessaloniki (the city center and largest in population size), Kalamaria, Neapoli-Sykies, Pavlos Melas, Kordelio-Evosmos, Ampelokipoi-Menemeni, and the municipal unit of Pylaia, part of the municipality of Pylaia-Chortiatis. 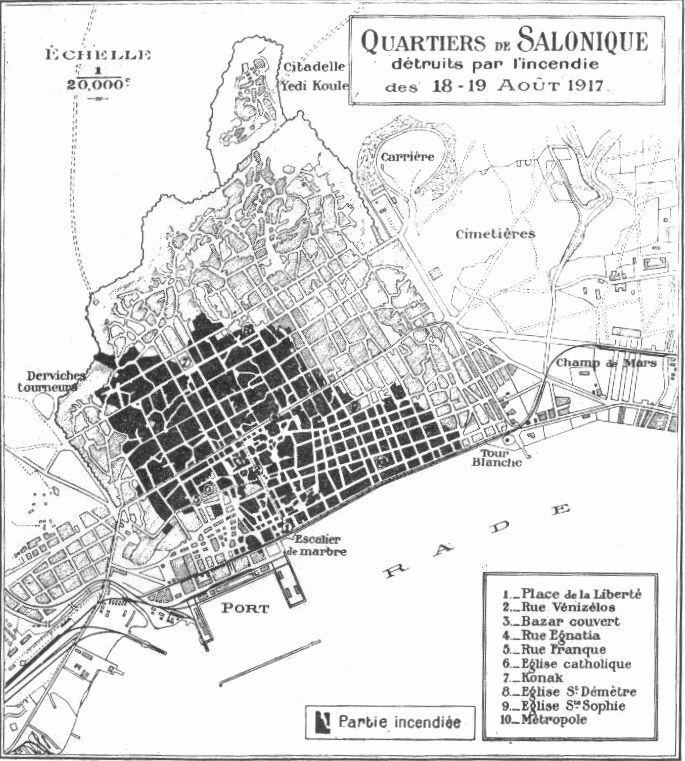 Prior to the Kallikratis reform, the Thessaloniki Urban Area was made up of twice as many municipalities, considerably smaller in size, which created bureaucratic problems. It is customary every year for the Prime Minister of Greece to announce his administration's policies on a number of issues, such as the economy, at the opening night of the Thessaloniki International Trade Fair. In 2010, during the first months of the 2010 Greek debt crisis, the entire cabinet of Greece met in Thessaloniki to discuss the country's future. Architecture in Thessaloniki is the direct result of the city's position at the centre of all historical developments in the Balkans. Aside from its commercial importance, Thessaloniki was also for many centuries the military and administrative hub of the region, and beyond this the transportation link between Europe and the Levant (Syria, Lebanon, Jordan, and Palestine). Merchants, traders and refugees from all over Europe settled in the city. The need for commercial and public buildings in this new era of prosperity led to the construction of large edifices in the city center. During this time, the city saw the building of banks, large hotels, theatres, warehouses, and factories. Architects who designed some of the most notable buildings of the city, in the late 19th and early 20th century, include Vitaliano Poselli, Pietro Arrigoni, Xenophon Paionidis, Leonardo Gennari, Eli Modiano, Moshé Jacques, Jean Joseph Pleyber, Frederic Charnot, Ernst Ziller, Roubens Max, Levi Ernst, Angelos Siagas and others, using mainly the styles of Eclecticism and Art Nouveau. Also called the historic centre, it is divided into several districts, of which include Ladadika (where many entertainment venues and tavernas are located), Kapani (were the city's central city market is located), Diagonios, Navarinou, Rotonda, Agia Sofia and Ippodromio, which are all located around Thessaloniki's most central point, Aristotelous Square. Various commercial stoas around Aristotelous are named from the city's past and historic personalities of the city, like stoa Francais, stoa Baron Hirsch, Carasso/Ermou, Pelosov, Colombo, Saul (Modiano), Morpurgo, Mordoch, Simcha, Malakopi, Olympios etc. The west point of the city centre is home to Thessaloniki's law courts, its central international railway station and the port, while on its eastern side stands the city's two universities, the Thessaloniki International Exhibition Centre, the city's main stadium, its archaeological and Byzantine museums, the new city hall and its central parklands and gardens, namely those of the ΧΑΝΘ/Palios Zoologikos Kipos and Pedio tou Areos. The central road arteries that pass through the city centre, designed in the Ernest Hebrard plan, include those of Tsimiski, Egnatia, Nikis, Mitropoleos, Venizelou and St Demetrius avenues. Southeastern Thessaloniki up until the 1920s was home to the city's most affluent residents and formed the outermost suburbs of the city at the time, with the area close to the Thermaic Gulf coast called Exoches, from the 19th century holiday villas which defined the area. Today southeastern Thessaloniki has in some way become a natural extension of the city center, with the avenues of Megalou Alexandrou, Georgiou Papandreou (Antheon), Vasilissis Olgas, Delfon, Konstantinou Karamanli (Nea Egnatia) and Papanastasiou passing through it, enclosing an area traditionally called Dépôt (Ντεπώ), from the name of the old tram station, owned by a French company. The area extends to Kalamaria and Pylaia, about 9 km (5.59 mi) from the White Tower in the city center. Some of the most notable mansions and villas of the old-era of the city remain along Vasilissis Olgas Avenue. Built for the most wealthy residents and designed by well known architects they are used today as museums, art galleries or remain as private properties. Some of them include Villa Allatini, Villa Bianca, Villa Mehmet Kapanci, Villa Modiano, Villa Mordoch, Villa Ahmet Kapanci, Hatzilazarou Mansion, Villa Morpurgo/Zardinidi, Château Mon Bonheur (often called red tower) and others. Most of southeastern Thessaloniki is characterized by its modern architecture and apartment buildings, home to the middle-class and more than half of the municipality of Thessaloniki population. Today this area of the city is also home to 3 of the city's main football stadiums, the Thessaloniki Concert Hall, the Posidonio aquatic and athletic complex, the Naval Command post of Northern Greece and the old royal palace (called Palataki), located on the most westerly point of Karabournaki cape. The municipality of Kalamaria is also located in southeastern Thessaloniki and was firstly inhabited by Minor Asia Greek refugees in 1922. Northwest Thessaloniki forms the main entry point into the city of Thessaloniki with the avenues of Monastiriou, Lagkada and 26is Octovriou passing through it, as well as the extension of the A1 motorway, feeding into Thessaloniki's city center. The area is home to the Macedonia InterCity Bus Terminal (KTEL), the Zeitenlik Allied memorial military cemetery and to large entertainment venues of the city, such as Milos, Fix, Vilka (which are housed in converted old factories). Northwestern Thessaloniki is also home to Moni Lazariston, located in Stavroupoli, which today forms one of the most important cultural centers for the city. With the 100th anniversary of the 1912 incorporation of Thessaloniki into Greece, the government announced a large-scale redevelopment program for the city of Thessaloniki, which aims in addressing the current environmental and spatial problems that the city faces. More specifically, the program will drastically change the physiognomy of the city by relocating the Thessaloniki International Exhibition Center and grounds of the Thessaloniki International Trade Fair outside the city centre and turning the current location into a large metropolitan park, redeveloping the coastal front of the city, relocating the city's numerous military camps and using the grounds and facilities to create large parklands and cultural centers; and the complete redevelopment of the harbor and the Lachanokipoi and Dendropotamos districts (behind and near the Port of Thessaloniki) into a commercial business district, with possible highrise developments. After the WWII, heavy industrialization of the city's suburbs began in the late 1950s. In recent years a spate of factory shut downs has occurred as companies take advantage of cheaper labour markets and more lax regulations in other areas. Among the largest companies to shut down factories are Goodyear, AVEZ (the first industrial factory in northern Greece, built in 1926),, Philkeram Johnson and VIAMIL (ΒΙΑΜΥΛ). Nevertheless, Thessaloniki still remains a major business hub in the Balkans, with a number of important Greek companies headquartered in the city, such as the Hellenic Vehicle Industry (ELVO), Namco (automobiles), Astra Airlines, Pyramis and MLS Multimedia, which introduced the first Greek-built smartphone in 2012. Foodstuff companies headquartered in the city include the Macedonian Milk Industry, Allatini, while the Goody's chain started from the city. The municipality of Thessaloniki is the most populated municipality of all the municipalities that are part of the Thessaloniki Urban Area and make up the "City of Thessaloniki". Although the population of the municipality of Thessaloniki has declined in the latest census, the metropolitan area's population is still growing. The city forms the base of the Thessaloniki Metropolitan Area, with latest census in 2011 giving it a population of 1,104,460. The Jewish population in Greece is the oldest in mainland Europe (see Romaniotes). When Paul the Apostle came in Thessaloniki he taught in the area of what today is called Upper City. Later, during the Ottoman period, with the coming of Sephardic Jews from Spain, the community of Thessaloniki became mostly Sephardic. Thessaloniki became the largest center in Europe of the Sephardic Jews, who nicknamed the city la madre de Israel (Israel's mother) and "Jerusalem of the Balkans". It also included the historically significant and ancient Greek-speaking Romaniote community. During the Ottoman era, Thessaloniki's Sephardic community comprised more than half the city's population; Jewish merchants were prominent in commerce until the ethnic Greek population increased after independence in 1912. By the 1680s, about 300 families of Sephardic Jews, followers of Sabbatai Zevi, had converted to Islam, becoming a sect known as the Dönmeh (convert), and migrated to Salonika, whose population was majority Jewish. They established an active community that thrived for about 250 years. Many of their descendants later became prominent in trade. Many Jewish inhabitants of Thessaloniki spoke Ladino, the Romance language of the Sephardic Jews. From the second half of the 19th century with the Ottoman reforms, the Jewish community had a new revival. Many French and especially Italian Jews (from Livorno and other cities), influential in introducing new methods of education and developing new schools and intellectual environment for the Jewish population, were established in Thessaloniki. Such modernists introduced also new techniques and ideas from the industrialized Western Europe and from the 1880s the city began to industrialize. The Italian Jews Allatini brothers led Jewish entrepreneurship, establishing milling and other food industries, brickmaking and processing plants for tobacco. Several traders supported the introduction of a large textile-production industry, superseding the weaving of cloth in a system of artisanal production. Other notable names of the era include the Italian Jewish Modiano family and the Italians Poselli. With industrialization, many people of all faiths became factory workers, part of a new proletariat, which later led to the establishment of the Socialist Workers' Federation. After the Balkan Wars, Thessaloniki was incorporated into the Greek Kingdom. At first the community feared that the annexation would lead to difficulties and during the first years its political stance was, in general, anti-Venizelist and pro-royalist/conservative. The Great Thessaloniki Fire of 1917 during World War I burned much of the center of the city and left 50,000 Jews homeless of the total of 72,000 residents who were burned out. Having lost homes and their businesses, many Jews emigrated: to the United States, Palestine, and Paris. They could not wait for the government to create a new urban plan for rebuilding, which was eventually done. In 1943 the Nazis began brutal, inhumane actions against the historic Jewish population in Thessaloniki, forcing them into a ghetto near the railroad lines and beginning deportation to concentration and labor camps where they dehumanized their captives. They deported and exterminated approximately 96% of Thessaloniki's Jews of all ages during the Holocaust. The Thessaloniki Holocaust memorial in Eleftherias ("Freedom") Square was built in 1997 in memory of all the Jewish people from Thessaloniki, who died in the Holocaust. The site was chosen because it was the place where Jews residents were rounded up before embarking to trains for concentration camps. Today, a community of around 1200 remains in the city. Communities of descendants of Thessaloniki Jews – both Sephardic and Romaniote – live in other areas, mainly the United States and Israel. Israeli singer Yehuda Poliker recorded a song about the Jewish people of Thessaloniki, called "Wait for me, Thessaloniki". Not only did the Jewish-Greek population of Thessaloniki perish during the Holocaust, but a unique civilization filled with rich culture and beauty was lost. Since the late 19th century, many merchants from Western Europe (mainly from France and Italy) were established in the city. They had an important role in the social and economical life of the city and in many cases introduced new industrial techniques. Their main district was what is known today as the "Frankish district" (near Ladadika), where locates also the Catholic church designed by Vitaliano Poselli. Some of them left after the incorporation of the city into the Greek Kingdom, others, who were of Jewish faith, were exterminated by the Nazis, while others stayed and their descendants still live in the city. Although Thessaloniki is not renowned for its parks and greenery throughout its urban area, where green spaces are few, it has several large open spaces around its waterfront, namely the central city gardens of Palios Zoologikos Kipos (which is recently being redeveloped to also include rock climbing facilities, a new skatepark and paintball range), the park of Pedio tou Areos, which also holds the city's annual floral expo; and the parks of the Nea Paralia (waterfront) that span for 3 km (2 mi) along the coast, from the White Tower to the concert hall. The Atatürk Museum in Thessaloniki is the historic house where Mustafa Kemal Atatürk, founder of modern-day Turkey, was born. The house is now part of the Turkish consulate complex, but admission to the museum is free. The museum contains historic information about Mustafa Kemal Atatürk and his life, especially while he was in Thessaloniki. Other ethnological museums of the sort include the Historical Museum of the Balkan Wars, the Jewish Museum of Thessaloniki and the Museum of the Macedonian Struggle, containing information about the freedom fighters in Macedonia and their struggle to liberate the region from the Ottoman yoke. Thessaloniki is home of a number of festivals and events. The Thessaloniki International Trade Fair is the most important event to be hosted in the city annually, by means of economic development. It was first established in 1926 and takes place every year at the 180,000 m2 (1,937,503.88 sq ft) Thessaloniki International Exhibition Center. The event attracts major political attention and it is customary for the Prime Minister of Greece to outline his administration's policies for the next year, during event. Over 250,000 visitors attended the exposition in 2010. 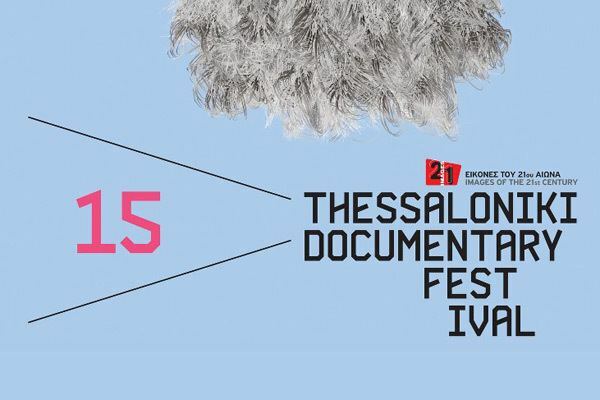 The new Art Thessaloniki, is starting first time 29.10. – 1 November 2015 as an international contemporary art fair. 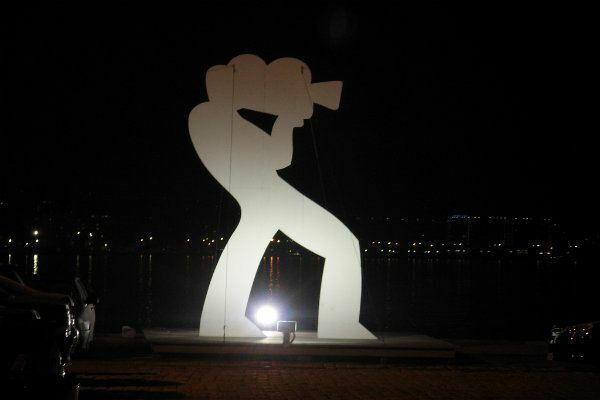 The Thessaloniki International Film Festival is established as one of the most important film festivals in Southern Europe, with a number of notable film makers such as Francis Ford Coppola, Faye Dunaway, Catherine Deneuve, Irene Papas and Fatih Akın taking part, and was established in 1960. The Documentary Festival, founded in 1999, has focused on documentaries that explore global social and cultural developments, with many of the films presented being candidates for FIPRESCI and Audience Awards. Throughout its history, Thessaloniki has been home to a number of well-known figures. It is also the birthplace of various Saints and other religious figures, such as Cyril and Methodius, creators of the first Slavic alphabet, Saint Mitre, Patriarch Philotheus I of Constantinople and Archbishop Demetrios of America. Many of Greece's most celebrated musicians and movie stars were born in Thessaloniki, such as Zoe Laskari, Costas Hajihristos, Antonis Remos, Paschalis Terzis, Natassa Theodoridou, Katia Zygouli, Kostas Voutsas, Marios Iliopoulos and Marinella. Additionally, there have been a number of political leaders born in the city Evangelos Venizelos, the former Minister of Finance of Greece, Haris Kastanidis, Christos Sartzetakis, fourth President of Greece, Kostas Zouraris and Ioannis Passalidis. Sports personalities from the city include Angelos Charisteas, Eleni Daniilidou, Dimitris Salpingidis, Traianos Dellas, Kleanthis Vikelidis and Ioannis Tamouridis. Ioannis Papafis and Elias Petropoulos were also born in Thessaloniki. The city is also the birthplace of a number of important international personalities, which include Bulgarians (Atanas Dalchev), Jews (Moshe Levy, Daniel Zion, Samuel ben Joseph Uziel, Shlomo Halevi Alkabetz), Slav Macedonians (Dimo Todorovski) and Turks (Mustafa Kemal Atatürk, Nâzım Hikmet, Afet İnan, Cahit Arf, Mehmet Cavit Bey, Salih Omurtak, Sabiha Sertel, Halil Rifat Pasha). Notable sweets of the city are Trigona, Roxakia and Armenovil. A stereotypical Thessalonian coffee drink is Frappé coffee. Frappé was invented in the Thessaloniki International Trade Fair in 1957 and has since spread throughout Greece and Cyprus to become a hallmark of the Greek coffee culture. On 22 May 1963, Grigoris Lambrakis, pacifist and MP, was assassinated by two far-right extremists driving a three-wheeled vehicle. The event led to political crisis. Costa Gavras directed Z (1969 film) based on it, two years after the military junta had ceized power in Greece. Additionally, a TEI (Technological Educational Institute), namely the Alexander Technological Educational Institute of Thessaloniki, is located in the western suburb of Sindos; home also to the industrial zone of the city. Numerous public and private vocational institutes (Greek: IEK) provide professional training to young students, while a large number of private colleges offer American and UK academic curriculum, via cooperation with foreign universities. In addition to Greek students, the city hence attracts many foreign students either via the Erasmus programme for public universities, or for a complete degree in public universities or in the city's private colleges. As of 2006 the city's total student population was estimated around 200,000. The construction of the Thessaloniki Metropolitan Railway began in 2006 and is scheduled for completion in 2020, where it is set to become the city's most vital public transport service. The line of Phase 1 is set to extend over 9.6 kilometres (6.0 mi), include 13 stations and it is expected to eventually serve 250,000 passengers daily. Some stations of the Thessaloniki Metro will house a number of archaeological finds. Discussions are already underway for future expansions, in order for the metro network to also serve major transport hubs of the city, notably the Macedonia InterCity Bus Terminal (KTEL) and Macedonia International Airport. For the expansion towards the airport, the Attiko Metro company is considering the construction of an overground network or a monorail. The expansion to Kalamaria, a southeast borough of Thessaloniki, has already become part of the initial construction phase, while future expansions are considered and planned for Efkarpia to the north and Evosmos to the west. The strategic plan for the construction of the Thessaloniki Metro envisions that the city will have a system of 3 lines by 2018 or 2020 at the latest. Air traffic to and from the city is served by Macedonia International Airport for international and domestic flights. The short length of the airport's two runways means that it does not currently support intercontinental flights, although a major extension – lengthening one of its runways into the Thermaic Gulf – is under construction, despite considerable opposition from local environmental groups. Following the completion of the runway works, the airport will be able to serve intercontinental flights and cater for larger aircraft in the future. A master-plan, with designs for a new terminal building and apron has also been released, and is seeking for funding. Thessaloniki lies on the crossroads of the A1/E75, A2/E90 and A25 motorways; which connect the city with other parts of the country, as well as the Republic of Macedonia, Bulgaria and Turkey.